Oyster crackers are small, salted, crackers, typically rounds about 0.59 in (15 mm) in diameter, although a slightly smaller hexagonal variety is also prevalent. They are popular in the northeastern USA, where they are served as an accompaniment to soup, and in the Cincinnati area, where they are frequently served with the city's distinctive chili. 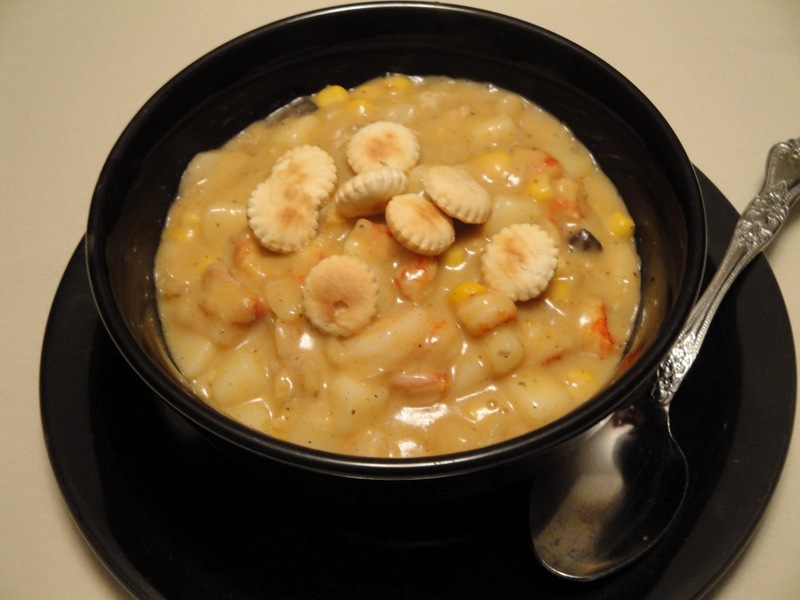 In New England, oyster crackers are served in oyster stew and chowders. Additionally, plain oyster crackers are sometimes seasoned with spices and seasonings. Despite their name, oyster crackers do not contain oysters. The origin of the term "oyster cracker" is unclear, but it may be that they were originally served with oyster stew or clam chowder or merely that their form (a vaguely round 'shell' that splits evenly into two parts) was suggestive of the shape of an oyster in its shell. According to the web site of the still-extant bakery discussed below, the crackers were so named because they were commonly served with oyster stew and other oyster dishes (at least on their early packages). They usually have a taste similar to saltine crackers, but far less salty. There are at least two rival claims for the invention of the oyster cracker, although Adam Exton is often credited for being the inventor of the oyster cracker. Adam Exton, the baker of Trenton, New Jersey emigrated to America from Lancashire, England in 1842. In Trenton, Exton opened a cake and cracker bakery with his brother-in-law, Richard Aspden in 1846. Although Aspden died the following year, Exton continued with the bakery (named the "Exton Cracker Bakery" or "Adam Exton & Co."). He invented a machine that rolled and docked pastry and solved the sanitary problems of hand-rolling crackers. The history of the oyster cracker was related by Exton's nephew, also named Adam Exton, in the Trenton Evening Times Newspaper on May 31, 1917. Even a cracker has a history. The past, present and future of the little disc of baked dough with "Exton" stamped across the face of it was discussed by Rotatian Adam Exton, of the Exton Cracker Company, at the weekly meeting of Trenton Rotaty Club held this afternoon at Hildebrecht's... Manufacture of the Exton oyster cracker was started in Trenton, in the same location now occupied by the company's factory of Center Street, in 1877. Adam Exton, uncle of the speaker, was the originator of the oyster cracker. At the outset the factory had an output of 100 pounds of crackers a day, 36 of them to a pound, making a daily capacity of 3,600 crackers. Oyster crackers became immensely popular and around 1848, one can find the first advertisements of merchants selling oyster crackers. The Westminster Cracker Company of Rutland, Vermont also claims to have been making oyster crackers since 1828. They may have made early crackers, but it is doubtful that they ever disputed the claim made by the Exton Cracker Factory to have been the true originators of the oyster cracker. You can have this dinner on the table in no time at all. Perfect weeknight dinner. In large pot, melt butter over medium heat. Add onions and salt, stir, cook until tender. Add cream of potato soup and cream of mushroom soup, stir well. Add potatoes, corn, shrimp, crawfish salt, pepper, seafood seasoning and creole seasoning. Stir well. Simmer for 15 minutes. Serve and garnish with oyster crackers. Enjoy! I love those little oyster crackers! I could just eat a bag of them, plain, but they are great as a soup topper too! Great chowder recipe! a warm and good dish! Sounds like the perfect chowder for me! Crawfish and shrimps are both my faves! I love how chunky this chowder is! Looks delish! Christine, I can't even tell you how wonderful this looks! Crawfish is hard to come by here, but this recipe looks so good that I might have to go hunt for some. If I had crawfish available to me I'd be making this chowder every day! Sounds delicious!! I love crawfish so any excuse to eat them is good for me! I'm also a big fan of oyster crackers - my mom used to mix them up with something (I should probably find out what - maybe it was just butter) and a powdered ranch packet and bake them - an awesome snack!